Gluten-free flours, such as almond, rice and coconut flours, don't behave the way traditional, wheat-based flours do. When you bake with these flours, you must adjust the other ingredients to compensate for the lack of gluten; otherwise, your breads, cakes or muffins might emerge from the oven too dense, dry, crumbly or gritty. 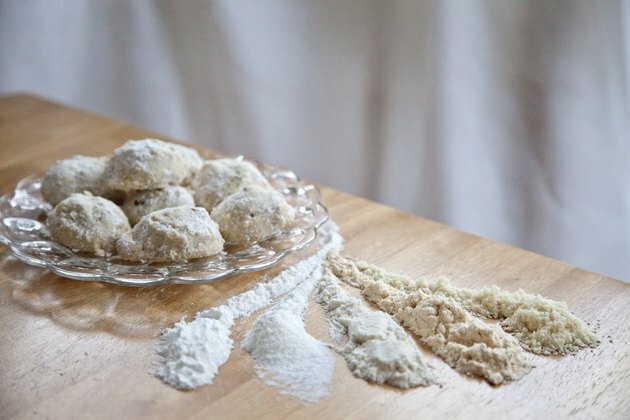 Instead of using just one kind of gluten-free flour, blend several types to produce healthful, natural baked goods with excellent taste and texture. 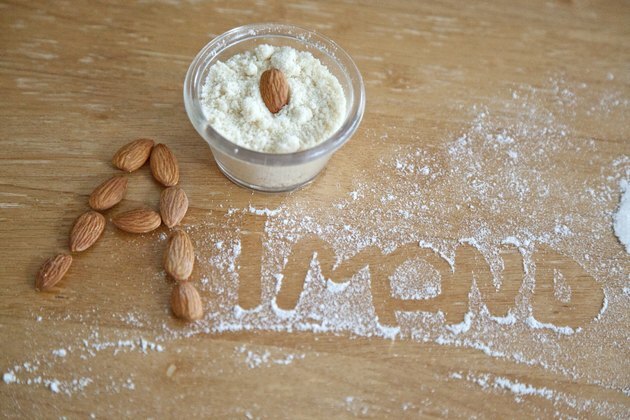 Almond flour is high in protein and fiber -- and it adds a rich, nutty sweetness to breads and cakes. Because it is high in fat, it is not suitable for people on low-fat or low-calorie diets. It is very absorbent and doesn't hold together as well as wheat flour, so add liquid to the recipe or reduce the total amount of flour to achieve the right consistency. Beth Hillson of "Living Without," a magazine with information for people on restricted diets, recommends using 25 percent almond flour in your flour blend, although you can use up to 50 percent in recipes using eggs. 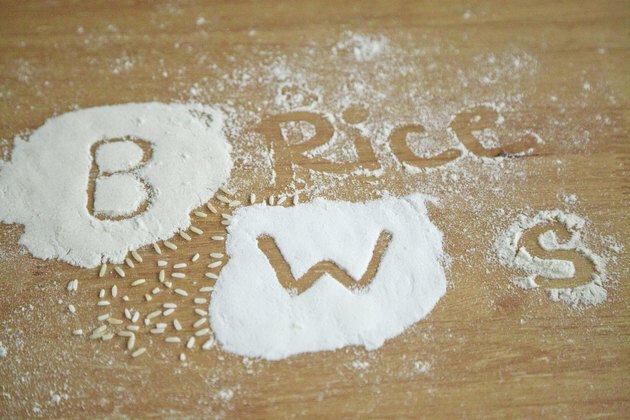 Several varieties of rice flour are available, including brown rice, white rice and sweet rice, each of which comes in fine, medium and coarse grinds. Hillson recommends baking with fine grinds and advises blending the flour with a high-protein flour, such as almond or coconut. Meredith McCarty, author of "Sweet and Natural: More Than 120 Sugar-Free and Dairy-Free Desserts," says that you can use brown rice flour by itself if you reduce the amount of liquid in the recipe. Experiment until you find a flour-liquid ratio that has the desired consistency. Coconut flour is lightly sweet and high in protein and fiber, but it creates very dense baked goods. According to natural foods expert and advocate Jenny McGruther, each cup of coconut flour will absorb as much liquid as 3 to 4 cups of wheat flour. Expect to add about six eggs and 1 cup of liquid for each cup of coconut flour you use. 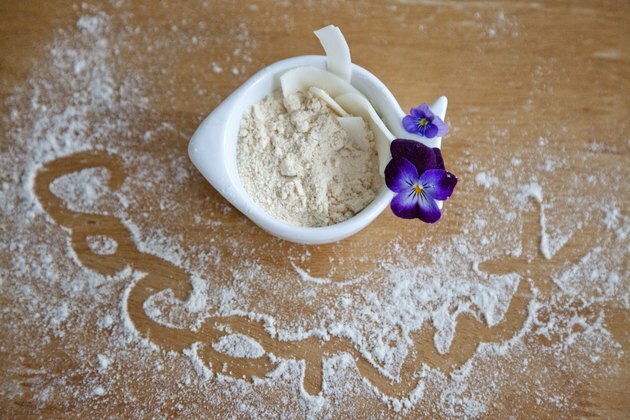 Beat and mix your batters thoroughly when using this kind of flour, as it tends to clump densely. Hillson suggests using no more than 15 percent coconut flour in your flour blend. 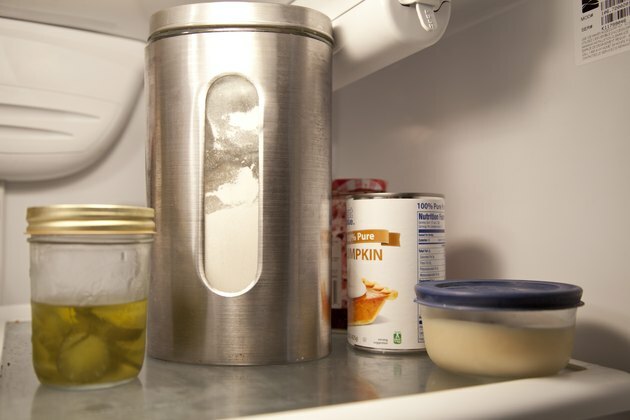 Store almond flour and brown rice flour in the refrigerator or freezer. These substances go rancid if you store them at room temperature and don't use promptly. Almond meal is not the same product as almond flour; it is considerably coarser, and it doesn't work as well for baking. If your gluten-free flour blend seems too crumbly or dry, add some pureed fruit or mashed pumpkin. These ingredients behave like butter, improving the moisture and structure of cakes, muffins and cookies -- but without the fat and calories. You can also add xanthan gum as a gluten-free binding agent. What Can I Use Instead of Eggs for Baking a Cake?